Parris Island is at risk of losing three-quarters of its land area to the ocean by the end of the century. Air Station Beaufort is home to one of the largest military airstrips in the world as well as fighter and attack squadrons belonging to both the Marine Corps and the Navy. MCRD Parris Island lies to the south of MCAS Beaufort and is one of only two installations in the nation where marine recruits are trained. Both are projected to face increased exposure to deeper and more severe flooding as sea levels rise. In the area around Beaufort, seas are projected to rise between 4.0 and 6.4 feet by the end of this century. Much of the land at Parris Island consists of marshes and the majority of the base lies less than 10 feet above sea level. 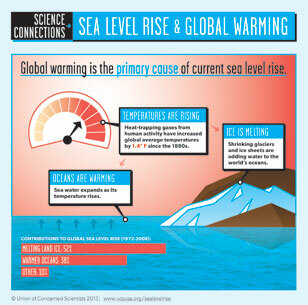 Major land losses are foreseeable as sea levels rise over the course of this century. MCAS Beaufort and MCRD Parris Island are located in Beaufort County, just south of the city of Beaufort in South Carolina Lowcountry. The region is relatively low lying, particularly MCRD Parris Island, where much of the land consists of marshes. The region is also home to US Naval Hospital Beaufort and a Marine Corps housing complex. 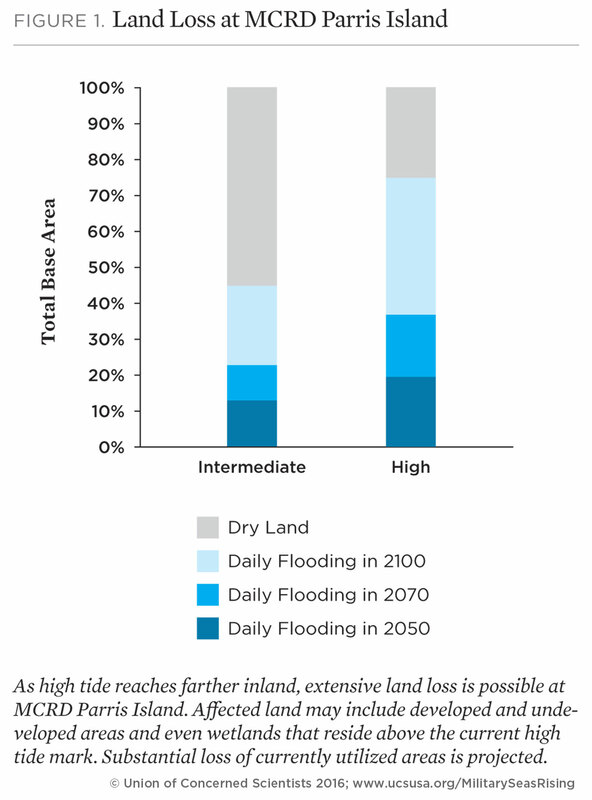 The bases' exposure to coastal flooding is projected for the years 2050, 2070, and 2100 based on the National Climate Assessment’s midrange or “intermediate-high” sea level rise scenario (referred to here as “intermediate”) and a “highest” scenario based on a more rapid rate of increase. The results below outline potential future flooding scenarios for MCAS Beaufort and MCRD Parris Island, assuming no new measures are taken to prevent or reduce flooding. Certain areas face daily high tide flooding. Today, tidal flooding affects low-lying locations around MCAS Beaufort and MCRD Parris Island, including extensive wetland areas, 10 times per year on average. By 2050, the currently flood-prone areas within both bases could experience tidal flooding more than 300 times annually and be underwater nearly 30 percent of the year given the highest scenario. Flooding during extreme high tides will become more extensive. Later this century, the higher water levels caused by extreme tides could inundate 85 percent of MCRD Parris Island’s land, both wetlands and developed areas, roughly 10 times per year given the highest scenario. Extensive land loss at MCRD Parris Island is possible. Parris Island is already highly prone to flooding. A projected 6.4 feet of sea level rise (the highest scenario) by 2100 would inundate three-quarters of MCRD Parris Island’s land, including developed areas, with the daily high tides. 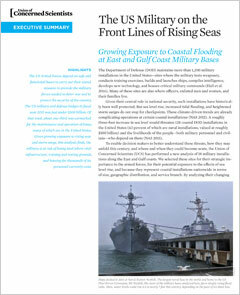 Sea level rise exposes previously unaffected areas of MCRD Parris Island and MCAS Beaufort to storm surge flooding. In this relatively low-lying area, sea level rise will have a substantial effect on the extent of inundation. In 2100 in the intermediate scenario, sea level rise increases the area of MCAS Beaufort exposed to flooding during all categories of storms by about 10 percent compared to today; exposure to flooding increases nearly 15 percent in the highest scenario. Sea level rise exposes MCRD Parris Island and MCAS Beaufort to deeper, more severe flooding. As sea level rises, the depth of inundation related to storm surge increases. In general, over time, the area inundated by five feet or more of seawater during storm surges increases. In an end-of-century worst-case scenario involving a Category 4 storm, a predicted six feet of sea level rise could double the area exposed to flood depths of 20 feet or more at MCAS Beaufort—from 17 to 34 percent of the installation. In order to plan effectively for the long term, military decision makers with authority over MCAS Beaufort and MCRD Parris Island need to understand how sea level rise may permanently alter the landscape of these coastal installations and where the threat of storm surge may become intolerable. To take action, however, individual installations like MCAS Beaufort and MCRD Parris Island will need more detailed analysis and resources to implement solutions. Detailed maps for each scenario at MCAS Beaufort and MCRD Parris Island are available via Dropbox. Learn more about communities on the front lines of climate change.